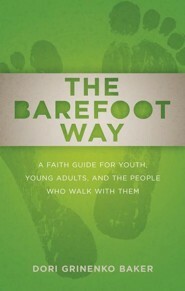 * Encourage teens to step barefoot onto life's holy ground and encounter our awesome God! 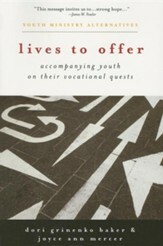 Inviting high school and college students on an exciting 21-day journey, Baker shares stories of kids who've committed themselves to Christ and shows your students how to L.I.V.E.---Listen, Immerse, View, and Explore. Ideal for individuals, small groups, and workshops. 128 pages, softcover from Westminster John Knox. This exceptional and innovative resource invites older youth, college students, and all who care about them, to participate for 21 days in journey and experiences of youth who have encountered God and told their story. Perfect for individual, small group, and workshop use, each day readers step "barefoot" onto the "Holy Ground" of these experiences in order to "L.I.V.E." the story themselves: To Listen, Immerse, View it Wider, and Explore Actions and "Aha" moments. Dori Grinenko Baker is a consultant with the Fund for Theological Education and their Calling Congregations and Vocation CARE programs, which support young people as they seek out their call in the world. She is also the author of Greenhouses of Hope, Doing Girlfriend Theology, and Lives to Offer. 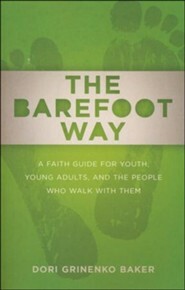 I'm the author/artist and I want to review The Barefoot Way: A Faith Guide for Youth, Young Adults, and the People Who Walk with Them.